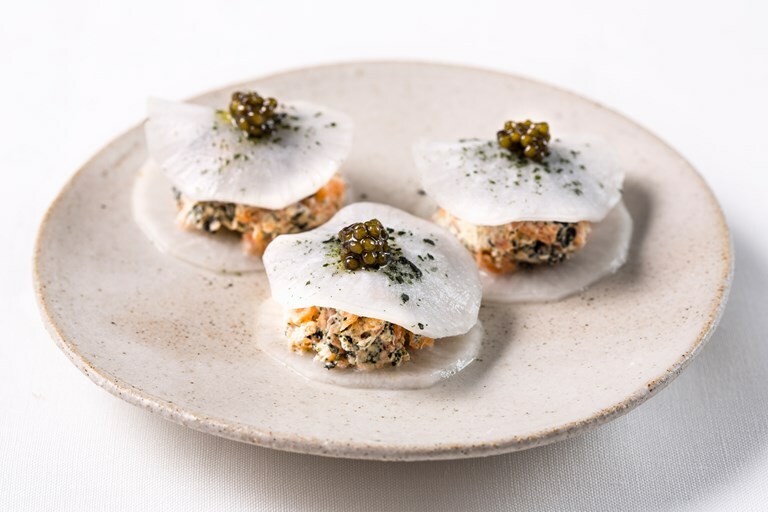 An artistic take on classic smoked salmon, caviar and crème fraiche blinis, Robin Gill's bite sized canapé sits between two thinly sliced rounds of delicate mooli radish and eats much like a soft shell taco – with the added benefit of being gluten-free. All the elements can be prepared in advance to be quickly assembled just before your guests arrive, and the simple technique of sprinkling powdered nori over the dish adds both a kick of saline savouriness and an attractive dark green finish. Fresh sea lettuce or seaweeds can be bought at most good fishmongers.